Discover the secrets about your self-healing abilities that the pharmaceutical companies don’t want you to know! Whether you’re dealing with something minor like a cold or something major like chronic pain, you can take responsibility for your own health! You don’t have to rely on doctors and depend on prescription drugs. The power to heal is already inside of you! This book is a call-to-action that will give you the powerful information you need to achieve optimum health, simply by tapping into your self-healing abilities. With this handy, easy-to-understand guide, you can have transformational tools for healing right at your fingertips. This remarkable book is the missing ingredient that will take you from where you are right now with your health to where you want to be! Grab your copy now to take your health to the next level! Over her ten-year career, Ana Marinho has helped hundreds of patients to ignite the power of their own self-healing. As a physical therapist, intuitive healer and health coach, Ana has a unique background and experience across a wide range of self-healing disciplines, allowing her to tap into both the scientific and the alternative aspects of healing simultaneously. In fact, when Ana was diagnosed with a chronic disease, she restored her own health using the same techniques outlined in this book — with no doctors and with no drugs. 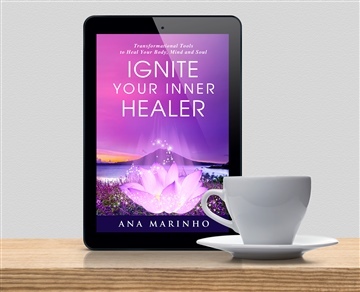 Ignite Your Inner Healer is a well-written and thought-provoking introduction to alternative healing and wellness. The author’s method of reading through and then slowly working with each chapter is a sound one, and I liked having access to a workbook designed for the text. Her ideas for pain management are particularly interesting and have proven to be useful since I’ve begun using them. Ignite Your Inner Healer is most highly recommended.